Our Goals Webelos is a 20 month program for 4th and 5th grade boys to prepare to join a Boy Scout troop while learning outdoor skills and participating in 20 different activity badges. A well-run group of Webelos is a gradual change from being an 'adult-run' den to being a 'boy-run' patrol ready to fit right into an adventurous scouting troop. 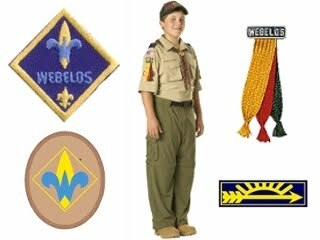 Summary The Webelos program has two major milestones - the Webelos rank badge to be earned at the 4th grade level and the Arrow of Light to be earned at the 5th grade. The final part of Webelos is bridging over into a Boy Scout troop selected individually by the scout. Is your Fourth Grader thinking about Scouts? Email the Den Leader at the link above and leave your phone number. Den Leader's like to help parents too. Another year of scouting means another year of new scouts! We would like to welcome our new Tiger Cubs to the Pack. We hope they are as excited as we are! Our Den Meetings are posted on the calendar (or they will be posted shortly) so keep an eye on the calendar for important dates. You should also plan to attend the Monthly Pack Meeting where you will meet ALL of our Scouts in grades 1 - 5. We also present awards and achievements at the Pack Meetings. Enjoy a great year of Scouting and a great year of fun. Glad to have you along! New Tiger Den Forming Soon! If you have a son graduating Kindergarten in May we have something for him (and you) to consider. How about Cub Scouting? We'd love to talk to you about the Cub Scout Program and the positive impact Scouts will have on your entire family. So send us an email of fill out the form on this page and let us know how we can help get your child started.